Let's get this out of the way right at the start: if you think it's great that Kelly Marie Tran would be driven off social media, you're a moron and we don't want you reading our site. Hell, I don't want you on the internet, or in the world. There is no reason for this kind of toxic nastiness, regardless of how one feels about The Last Jedi or her character, Rose Tico. Now, we all here loved The Last Jedi, and I simply cannot fathom the hatred for Rose outside of the usual misogyny and racism that rears its ugly head in communities worldwide. She plays an important role in the film, and is an interesting, fleshed-out character who fits right in alongside the other characters across the Star Wars trilogies. But regardless of anyone's feelings on the character she plays, it's absolutely pathetic that the real live woman would be driven from social media because of these cretins who claim to be "fans" of something. If you're involved with that, you should be ashamed. For the most part, Star Wars has been the story of the upper class: yes, Han Solo lives in his car and Luke Skywalker is a penniless hillbilly, but they spend three movies rubbing elbows with a literal princess and her fellow commissioned officers. The prequels come next, following the adventures of the queen of a planet and the army of royal laser-monks. Everybody is always unerringly important, even before the plot finds them... and up walks The Last Jedi, making a main character out of a maintenance worker. And who does she befriend? Vice-Admiral Prom Dress? No, the janitor. And then their subplot specifically shows more of the Star Wars' underclass, deepening the world even further. And yet people say it, and she, serves no purpose? That's foolish! She has a goal, she accomplishes her goal, and it wouldn't have been accomplished without her. Rose is featured in the same black-and-red window box as the other Star Wars Black figures in this scale. It remains a really nice way of packaging these toys, and I'm sure mint-in-box collectors will appreciate the level of consistency kept across releases. The window here also gives you a good look at the figure, which not only shows off the toy but also means you can make sure the paint is all up to scratch. Plus the number on the side means you can tell at a glance whether there's anything you need on the pegs. 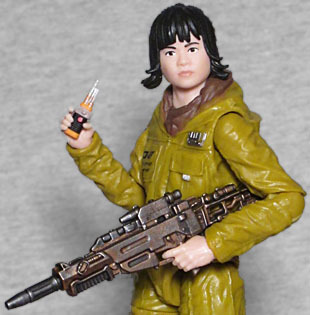 Rose sports a decent likeness to Kelly Marie Tran; it's not perfect, but with the screen-accurate "Resistance Tech" outfit it's very recognizable as the character. The figure does suffer from narrowly missing out on the face-printing technology that Hasbro is using now, but it's not terrible. I really like how her hair is accurately swept back in a ponytail with the strands hanging either side of her face. The sculpt of the clothing is the biggest star here; the techniciann overalls here have realistic folds and creases, legitamately looking oversized for the character, which is very nice, and very accurate to the film. There's also very good detail on this garb, including appropriate logos and patches, as well as the small canisters on her shoulder and belt. As a series of figures, Star Wars Black has varied in terms of paint quality, but Rose seems solid; you can always check her through the window, if you manage to find her in a store. 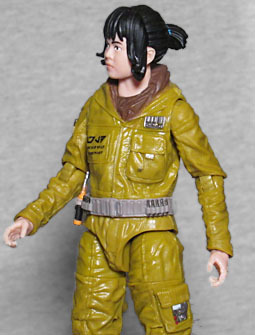 As with other Star Wars Black figures, Rose has solid articulation, with balljoints at the head, neck, shoulders, elbows and legs; then further joints in the thighs, knees and ankles. She's plenty poseable and looks great in many poses, and has no problems standing. Because Kelly Marie is only 5'2", Rose is not a tall woman; and because Rose is not a tall woman, this is not a tall action figure - she doesn't even reach the 5⅜" mark. Rose has two accessories and they're both winners; first up, the taser that she used to discipline Finn after he was attempting "escape," accurately detailed with black and metal paint over the orange plastic. It looks great, exactly as it does in the film, and she can weild it in either hand. To make it even better, it slots into her belt when not in use, alongside the small cannisters. The other is a Resistance Blaster, previously seen with the Resistance Trooper and Poe/Stormtrooper 2-pack. It's appropriately large and she looks great holding it, going with the oversized overalls to work for the character. 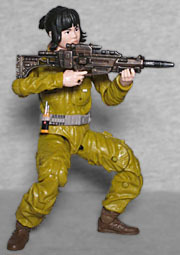 The detail on the blaster is simple but striking, making an excellent accessory for the figure. This is a great figure, of a great character. The only way this could have been improved would be through the newer face-printing technology, and perhaps with her important moon necklace as part of the sculpt. Regardless, this is a must-have for fans and a great addition to your collection.